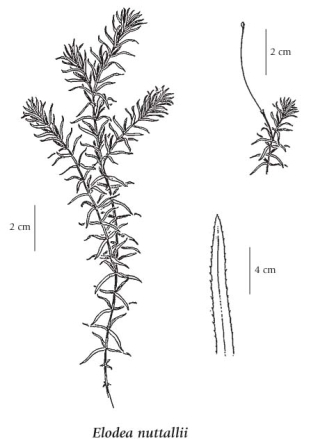 Nuttall's waterweed is a perennial aquatic species that is found in North America across much of the United States and in five Canadian provinces (BC, MB, ON, NB, QC) (USDA 2011). In British Columbia, it is found in "lakes, ponds and streams in the lowland, steppe and montane zones" in the southern part of the province (Douglas et al. 1999). Perennial aquatic herb from a fibrous root; flowering stems several, branched at the nodes. Stem leaves in whorls of 3, linear to linear-lanceolate, narrowly tapering to the pointed tips, 6-13 mm long, 0.3-1.8 mm wide, minutely sharp-toothed. Inflorescence of either male or female, axillary, solitary flowers, the male flowers unstalked, breaking away and floating to the surface where they open; petals 3, white, elliptic, 0.5-1 mm long or lacking (male) or 2-3 mm long (female); sepals 3, greenish, broadly lanceolate, about 2 mm long (male) or 2-3 mm long (female); stamens 9. Capsules, cylindric or egg-shaped, 5-7 mm long; seeds several, short soft-hairy, about 4 mm long. Lakes, ponds and streams in the lowland, steppe and montane zones; rare in S BC; E to ON and SW PQ and S to MA, PA, NC, AL, AR, OK, NM, ID and CA.